A new medical study has reported indications of dampening of the inflammation that brings on autoimmune diseases. The study was published in the peer-reviewed Journal of Immunology in April of 2018 and confirms the hypothesis that bicarbonate of soda does have medical merit and can be a simple cure to autoimmune diseases. The research report is titled Oral NaHCO3 Activates a Splenic Anti-Inflammatory Pathway: Evidence That Cholinergic Signals Are Transmitted via Mesothelial Cells. NaHCO3 is the chemical makeup of bicarbonate of soda, commonly known as baking soda. Splenic refers to the spleen. Cholinergic refers to choline, a primary component of the neurotransmitter acetylcholine found in nerve fibers, are thin plate-like calls that cover the walls of fluid containing cavities within the body. 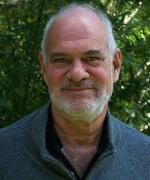 The study was conducted at the Medical College of Georgia at Augusta University and funded by grants from the National Institutes of Health. The researchers’ message is: Our data indicate that oral NaHCO3 activates a splenic anti-inflammatory pathway and provides evidence that the signals that mediate this response are transmitted to the spleen via a novel neuronal-like function of mesothelial cells. Their research discovered the spleen’s role in mitigating inflammation beyond raising acidic pH levels to higher alkaline levels, which is a recognized attribute of baking soda even in mainstream medicine. Sodium Bicarbonate (NaHCO3) commonly called baking soda is a natural substance used in the human body within the bloodstream to regulate pH as a counterbalance to acid build up. Bicarbonate affects the pH of cells and tissues, balances cell voltage, and increases CO2 which helps with oxygenation. This process is essential for life. Sodium Bicarbonate can be used as a first line of defense for a vast range of sickness including, cancer, flu, diabetes, kidney disease and even the common cold. Sodium Bicarbonate can be used in many forms whether transdermally in a bath, orally or nebulized for lung conditions. Recently I published an essay on the multiple causes of autism and new ways of treating it, which includes a universal recommendation to autism patients to include sodium bicarbonate in their protocols. Chronic inflammation in the brains of autistic patients, resulting from an over-active immune system is a sign of autoimmunity. The inflammation indicates that the brain is responding to a process that is stressing or damaging brain cells, a process which might include oxygen radicals. Why is Bicarbonate so Important? The most important function of alkaline water is to increase bicarbonates in the blood because we lose bicarbonates as we age. The change of pH value causes the stomach to produce hydrochloric acid that enters the stomach, and the bicarbonates enter the bloodstream. 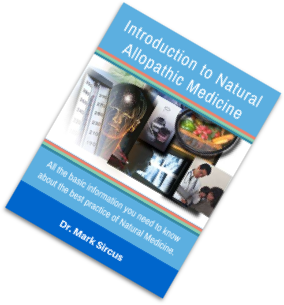 When we say that we alkalize our body, we do not necessarily mean increasing our saliva pH or urine pH; it means increasing the bicarbonates in our blood. The blood pH does not change, but the ability of our blood to neutralize acid in the body increases quite dramatically. In the January/February 2003 issue of American Industrial Hygiene Association Journal, Dr. Gospodinka R. Pradova published the result of a 10-year study of industrial pollution in Bulgaria. The study compares two groups of people in a plastic manufacturing plant: one group working in the plant with chemical pollution, the other in the non-polluted office environment of the same company. The conclusion shows that people living/working in a polluted environment have fewer amounts of bicarbonates in their blood than people working in a clean environment. Therefore, if you are a city dweller with a fair amount of air pollution you should take notice of your bicarbonate levels and eat a diet high in antioxidants. Bicarbonate is present in all body fluids and organs and plays a major role in the acid-base balances in the human body. Bicarbonate deficiencies spell big trouble for human physiology when the vascular system begins to deteriorate as less oxygen is delivered to the cells. Bicarbonate deficiency is synonymous with carbon dioxide deficiencies, which occur in everyone who does not exercise properly. Bicarbonate is the wonderful medicine it is because it turns into carbon dioxide in the stomach, which drives bicarbonates into the blood. “The emergency department is always noisy, but today the triage nurse is yelling "not breathing," as she runs toward us pushing a wheelchair. A pale, thin woman is slumped over and looking gray. Without concrete proof of a "Do Not Resuscitate" order, there’s no hesitation. Click, klang, and the patient has a tube down her throat within seconds. I do the chest compressions. On the monitor, she is flat-lining — no heartbeat. I synchronize my words with the compressions and call out for an external pacemaker. Pumping … thinking: Cardiac standstill … after walking in … with cancer … on chemo. This resuscitation isn’t by the book. "Get two amps of bicarbonate," I say to the intern. The jugular line takes seconds, and I flush it with sodium bicarbonate. This probably will correct the blood’s extreme acidity, which I suspect is driving up the potassium. The external pacemaker finally arrives. Potent electric shocks at 80 beats per minute begin to stimulate her heart. The vitals stabilize. Sodium bicarbonate is not only an excellent agent for natural chemotherapy, bringing as it does higher O2 levels through increased alkalinity to the cells, it is also one of the most basic medicines we have for kidney disease. New research by British scientists at the Royal London Hospital shows that sodium bicarbonate can dramatically slow the progress of chronic kidney disease. Dr. SK Hariachar, a nephrologist who oversees the Renal Hypertension Unit in Tampa Florida stated, upon seeing the research on bicarbonate and kidney disease, “I am glad to see confirmation of what we have known for so long. I have been treating my patients with bicarbonate for many years in attempts to delay the need for dialysis, and now we finally have a legitimate study to back us up. Not only that, we have the added information that some people already on dialysis can reverse their condition with the use of sodium bicarbonate”. Oral sodium bicarbonate eases hyperphosphatemia in peritoneal dialysis (PD) patients with metabolic acidosis, researchers reported at Kidney Week 2012. Sodium bicarbonate was given orally with a total dose of 3,900 mg daily for one month. With oral sodium bicarbonate, serum bicarbonate improved significantly from 19 to 24.9. Results showed that 69% of treated patients had phosphate levels below 5.5 and calcium-phosphate product below 55, which are the target levels recommended by guidelines developed under the Kidney Disease Outcomes Quality Initiative. The investigators concluded that oral sodium bicarbonate treatment corrects metabolic acidosis. Military manuals suggest doses or infusions of sodium bicarbonate to help alkalinize theurine if uranium contaminates the kidneys. This makes the uranyl ion less kidney-toxicand promotes excretion of the nontoxic uranium-carbonate complex. The oral administration of sodium bicarbonate diminishes the severity of the changes produced by uranium in the kidneys. This makes the uranyl ion less kidney-toxic and promotes excretion of the nontoxic uranium-carbonate complex. The World Health Organization (WHO) has classified outdoor air pollution as a leading cause of cancer in humans. "The air we breathe has become polluted with a mixture of cancer-causing substances," said Kurt Straif of the WHO’s International Agency for Research on Cancer (IARC). One of the reasons bicarbonate is so important to the worlds populations, 95 percent who now live in urban centers with heavy pollution, is that breathing toxic air creates massive bicarbonate deficiencies in the blood! The heavy metals in the air we breathe contribute to carcinogenesis by inducing/increasing oxidative stress. Oxidative stress damages DNA and can lead to mutations that promote cancer. Heavy metals also disrupt the process of apoptosis (programmed cell death). Apoptosis is vital for safe removal of sick/unhealthy cells, including cells that may become cancerous. 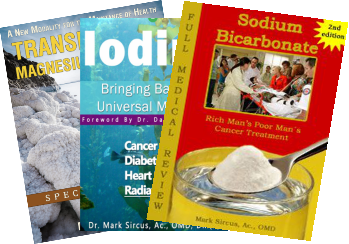 Researchers reported that bicarbonate increases tumor pH (i.e., make it more alkaline) and also inhibits spontaneous metastases (Robey 2009). They showed that oral sodium bicarbonate increased the pH of tumors and reduced the formation of spontaneous metastases in mice with breast cancer. It also reduced the rate of lymph node involvement. “The results of a study suggest that tumor cells do, indeed, perform niche engineering by creating an acidic environment that is non-toxic to the malignant cells but, through its negative effects on normal cells and tissue, promotes local invasion.” Tumor invasion did not occur into regions with normal or near-normal pH. Sodium Bicarbonate plays a central role in the maintenance of the Acid-Base balance in the organism and in addition in the optimization of blood perfusion in the circulation and therefore in the oxygenation of all body-organs. Under clinical conditions, low oxygen and low carbon dioxide/bicarbonate generally occur together. Therapeutic increase of carbon dioxide, by oral use of bicarbonates and by slowing the breathing down is an effective means of improving the oxygenation of the blood and tissues. Bicarbonate is an essential nutrient and our stomachs, pancreas and kidneys often must struggle to produce enough—especially as we get older. 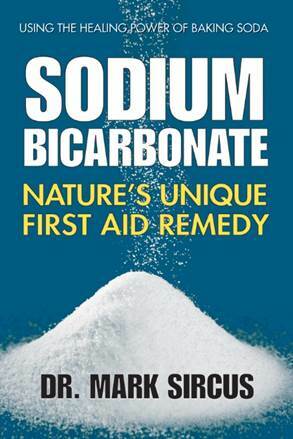 Doctors who warn people away from taking additional bicarbonate should have their licenses taken away! Bicarbonate is nutritional! This is my favorite way of getting bicarbonate, potassium and magnesum into my body. 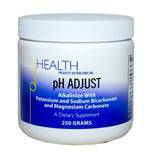 pH ADJUST may be used to increase salivary and urinary pH; counteract overly acidic conditions in the digestive tract, blood, and kidneys; and to supplement the body with the minerals potassium, magnesium, and sodium. The product contains (in powder form) potassium bicarbonate, magnesium carbonate, potassium glycinate, and sodium bicarbonate. Each serving (about ¼ tsp) contains about 300 mg of bicarbonate, 260 mg of carbonate, 142 mg of potassium, 105 mg of magnesium, 48 mg of sodium, and 100 mg of glycine. Another good way of taking sodium bicarbonate is to squeeze a fresh lemon into the glass, which turns it instantly into carbon dioxide. I no longer recommend taking bicarbonate with maple syrup or black strap molasses if one is using it for cancer treatment unless one is starving to death because the cancer is consuming all your glucose. It is vital to know that most viruses are pH sensitive so taking baking soda can prevent much misery and death in the world but the CDC is not interested in the very best medicine that is incredibly inexpensive, safe and effective for viral infections.